In true Paula Peck fashion, this seemingly vegetarian recipe actually includes bacon. It definitely adds a smokey deep flavor to the dish. Possibly so rich it could be eaten as a meal by itself. However, the bacon can easily be omitted for a slightly lighter, more vegetarian friendly version. 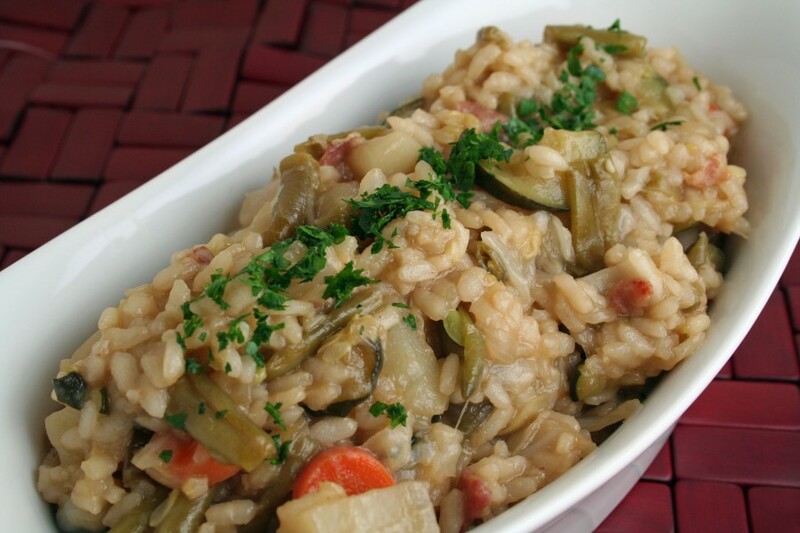 I use what I know as the traditional method for making a risotto: stock or liquid is added a little at a time, allowing to absorb after each addition. Her recipe from “The Art of Good Cooking” is a little more like rice pilaf, where most of the liquid is added all at once and put in the oven until the liquid is absorbed. I personally like to watch the rice and texture as it softens to ensure the rice doesn’t overcook. I’m more comfortable with this stove top method and prefer to save the oven for pilaf but I have included both instructions below. This is also a great recipe for using all of that wonderful spring produce that should be available any day now. Feel free to swap out the vegetables for whatever you have on hand. Combine butter, bacon, and olive oil in a deep, heavy pot. When hot and bacon is sizzling, add onion, garlic, potatoes, and carrot. Saute over high heat for 4-5 minutes. 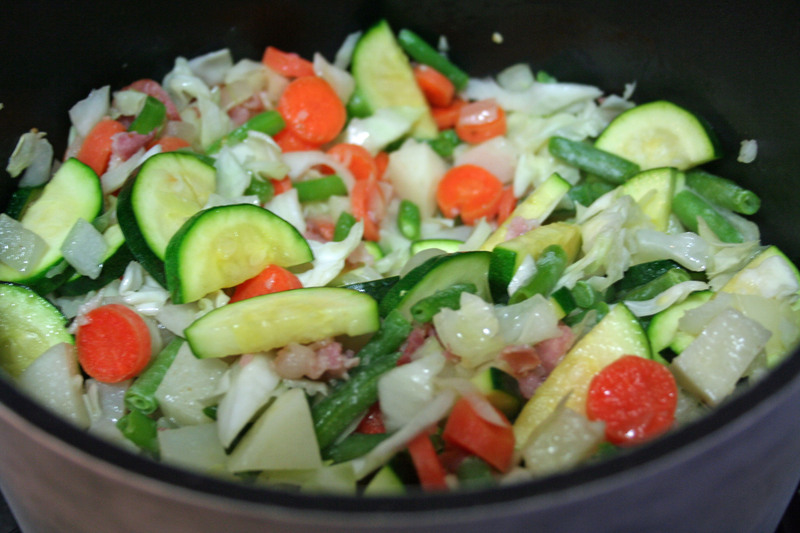 Add remaining vegetables and saute for another 5 minutes. Season with salt and pepper. Add dry rice and saute for a few minutes longer. Meanwhile warm stock over medium heat until simmering. Remove from heat. Add stock to rice mixture, about a 1/2 cup at a time, stirring constantly and allowing each addition to absorb before adding the next, until the rice is tender but still firm to the bite and the mixture is creamy. About 20 minutes total. Season with salt and pepper and stir in Parmesan cheese. Add 3 cups of liquid (stock, tomato juice, or any combination), along with a good amount of salt and pepper. Place in 350 degree oven, uncovered, and allow to simmer until liquid is almost absorbed. Add a little more liquid, and continue to cook, uncovered until rice and vegetables are tender. A bit more or less, liquid maybe needed. Check seasoning and stir in grated Parmesan cheese.